Leek Season 2015 has begun in Southern Ont. 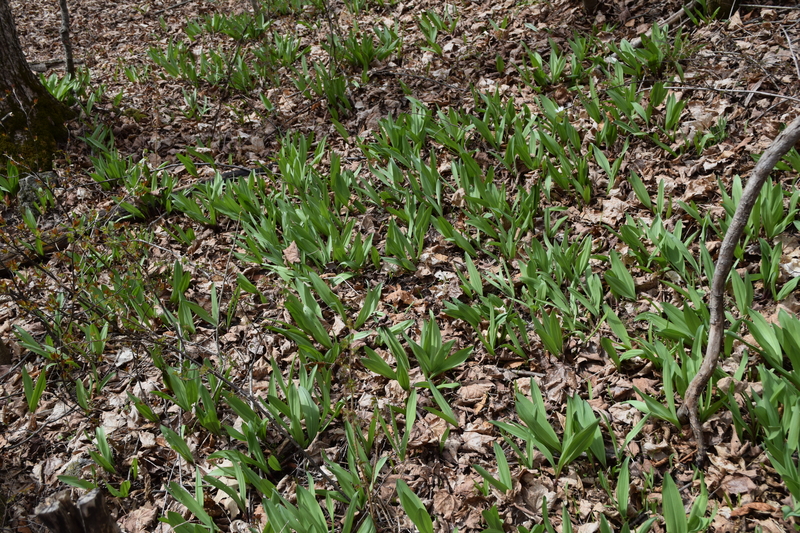 Normally Leek season is well underway by the end of April here in Southern Ontario. This year though, we have had unseasonably cold temperatures and lots of late snows. This can put the start of leak season in question. In an effort to try and determine at what stage the leeks were at, I decided to take a trip to a friends farm in search of these pungent edibles. Ever curious, my young daughter decided she wanted to come along with Da Da to see what all the fuss was about. 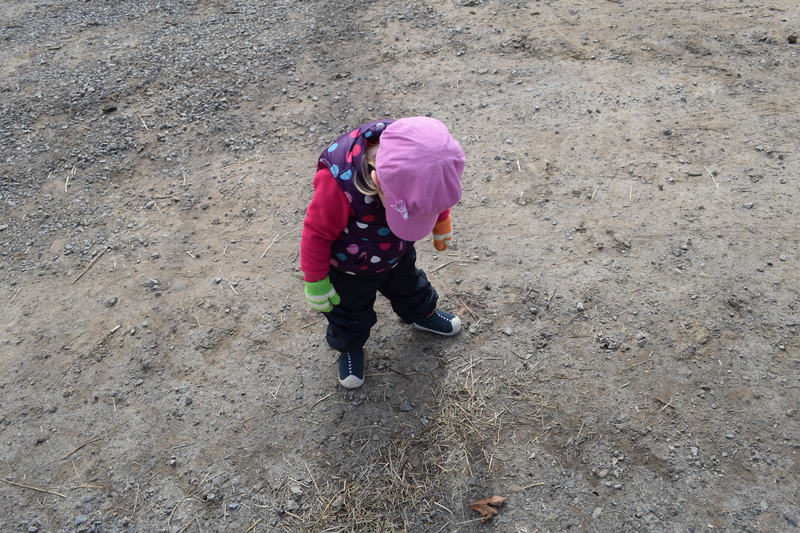 Armed with her favourite hat and a garden trowel we took the drive out to the farm and set out to explore. 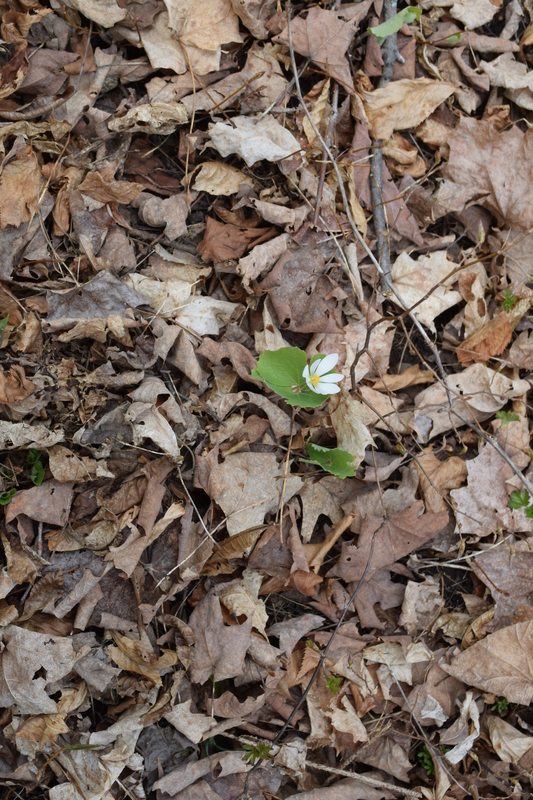 Our first foray into the woods found a large patch of trout lilies. Although not what we were looking for, trout lilies are considered edible by some, albeit slightly emetic if consumed in large quantities. We picked a few bunches for a small salad. 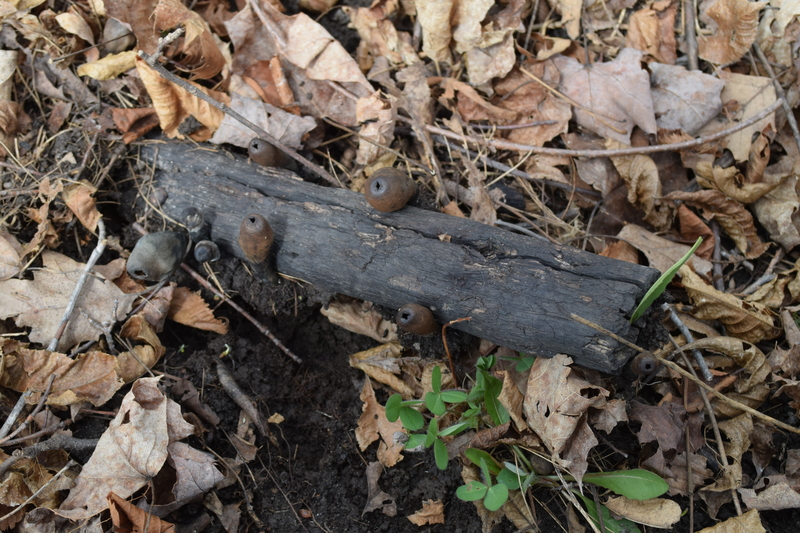 Our trip continued to a different section of woods. One that contained hardwood trees and southern exposure. Sure enough, these characteristics, coupled with soft, dark, and rich loamy soil makes for an almost sure bet for finding Leeks. Of course Lorelei had to take a turn at digging. 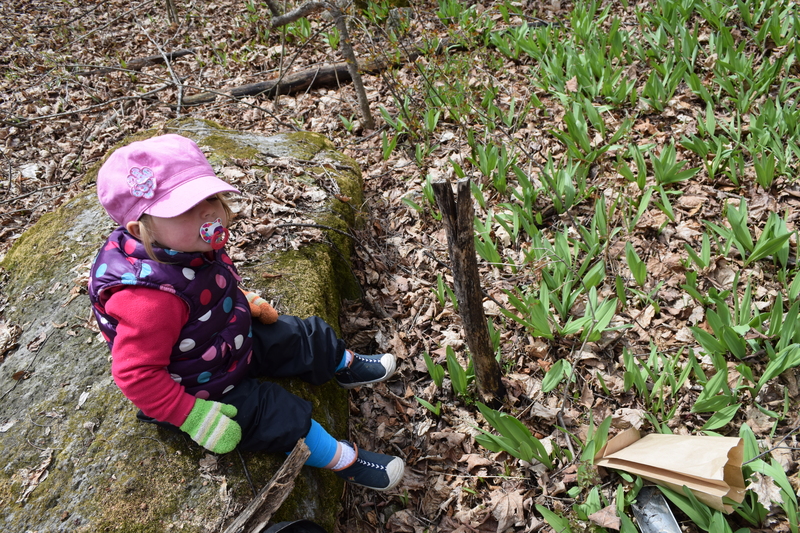 Then she got tired and decided to take a break on a nearby rock to watch Dada pick a few more. As a reminder, foragers should only harvest a few stalks from each cluster to preserve the colony for future harvests. These plants take a while to replenish so they are very susceptible to overharvesting. Be conservative now to ensure a life time of picking in the future. 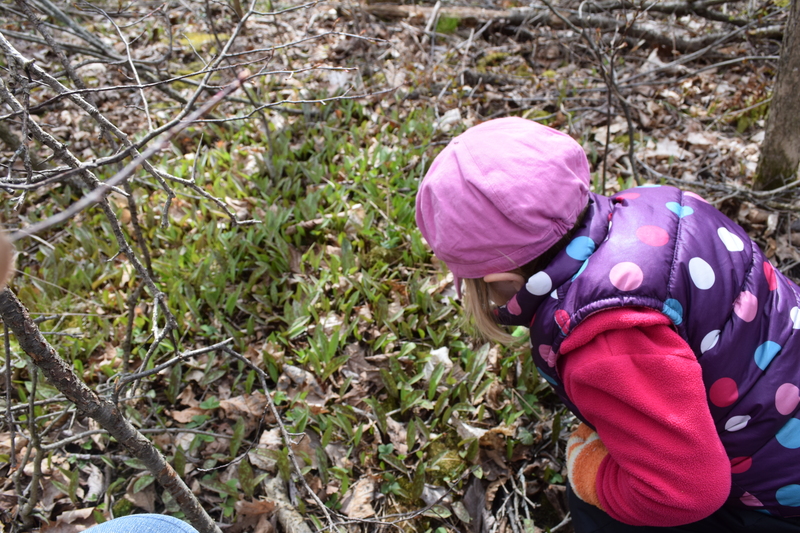 Lots of other interesting spring plant life to see including spring beauties and mushroom life. So for all those wondering what is up with the Leeks this year, they are out but its still early. Some have yet to reach their full size. Give it another week or two and things will really be underway. 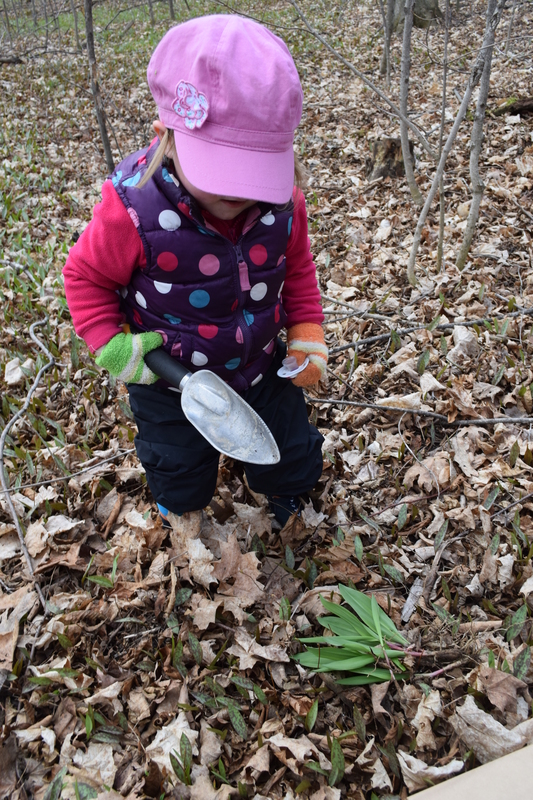 This entry was posted in Cooking, Foraging and tagged 2015 leek season, get outdoors, Get Outside, picking wild leeks, ramps, the wilds of ontario, wild leeks in 2015, wild leeks in Ontario, wild ontario, wild ramps in ontario, wildont. Bookmark the permalink. I’ve bee seeing pictures of them just a bit to the south of me, but when I went to the Madison Farmer’s Market yesterday (Saturday), one of the booths had them for sale, so cultivated ones are up here. I haven’t looked specifically for them yet- I’ve been too busy trying to nail down the turkeys. Where we are you don’t have to go very far to find leeks. 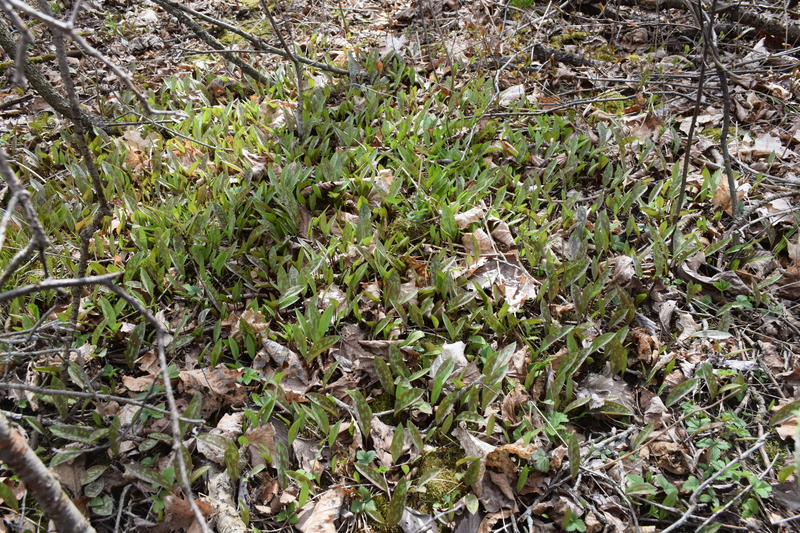 They are often one of the first plants up in the spring and there distinctive green colour sets them apart form the rest of the forest floor. I bet you could make some tasty combinations with a recently harvested turkey and some freshly foraged leeks! Good luck with the turkeys.